Gift of the Fellows Fund, 1988. Juan Francisco Andrés de Uztarroz (1606-1653); John Cochran, London; Sir Thomas Phillipps (Ms. 3026); Katharine Fenwick; Thomas FitzRoy Fenwick; Alan George Fenwick; William H. Robinson, Ltd.; Robinson Trust; H.P. Kraus, New York; Sam Fogg, London. Ms. miscellany; written and decorated in Spain between 1479 and 1618. This collection was compiled in the 17th century by Juan Francisco Andrés de Uztarroz (1606-1653) to aid him in his genealogical work; most of the documents concern the Carroz family and the Count of Giumera--Cf. Books on manuscript illumination. Texts: genealogical documents, autograph letters, together with 12 pages from two printed books, and 7 pages of colored drawings. Decoration: seven colored drawings (fol. 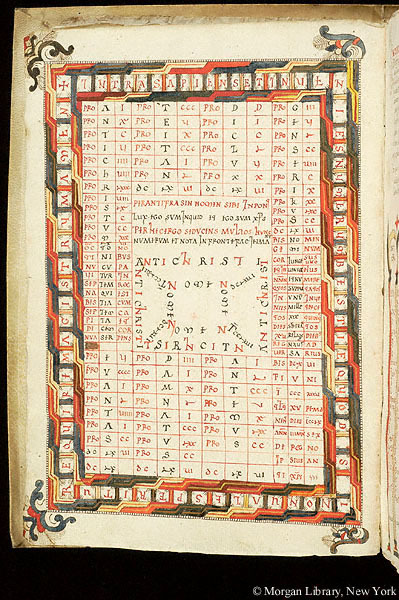 6v-12v); the seven colored drawings were copied from a Beatus manuscript then in the Aragonese monastery of Montearagón--Cf. PML files. Artist: Vincencio Juan de Lastanosa, who names himself as the copyist of the drawings on fol. 10.